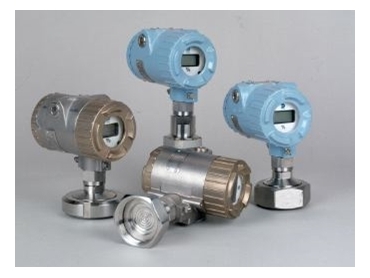 The Druck range of pressure transmitters. DRUCK has announced a newly expanded series of rangeable 4-20mA 2-wire pressure transmitters, for applications where 2-way Smart/HART digital communications are not required. Based upon Druck’s micromachined silicon pressure sensor, the RTX 1000 Series is now available in ranges from 70mbar up to 1400 bar with full 10:1 rangeability and accuracy ±0.15 per cent or ±0.075 per cent. Together with a choice of aluminium alloy or stainless steel housing and hazardous area versions, the RTX 1000 provides a cost effective alternative to fixed range sensors for applications in many industries. The transmitter’s electrical interface is a traditional 2-wire 4-20mA and includes NAMUR NE43 standard compliant diagnostics usually associated with premium cost/performance devices: overpressure, underpressure or failure conditions are indicated by a pre-defined signal level. In addition, any span within a 1:1 to 10:1 ratio of the upper range limit can be configured via a simple set-up routine using pushbuttons located on the electronics board. The electronics are fully enclosed yet readily accessible via a screw-off housing end cap. The compact and lightweight housing enables, in most cases, direct mounting to the process itself, eliminating the need for additional hardware. The choice of process connections includes male or female 1/2" BSP and 1/2" NPT connectors which enables direct replacement of a conventional pressure gauge without adaptors. An integral Hastelloy media isolation diaphragm enables use in hostile industrial applications. To complement the adaptable sensor Druck also released a wide range of hygienic fittings suitable for the food, beverage and pharmaceutical industries. Included is the triclover style, IDF, RJT and DIN 11851, making the RTX 1000 series suitable for use in a wide range of applications where sanitary requirements are essential. Davidson Measurement 03 9580 4366.